Former U.S. Vice President, Al Gore, said he is “thrilled” by Pope Francis’ leadership in the battle against climate change in an interview with Vatican News Wednesday. Mr. Gore, who has been called out for failed prophecies, half-truths, bad science, and neo-Malthusian doomsday propaganda, continues to enjoy celebrity among many committed climate alarmists. 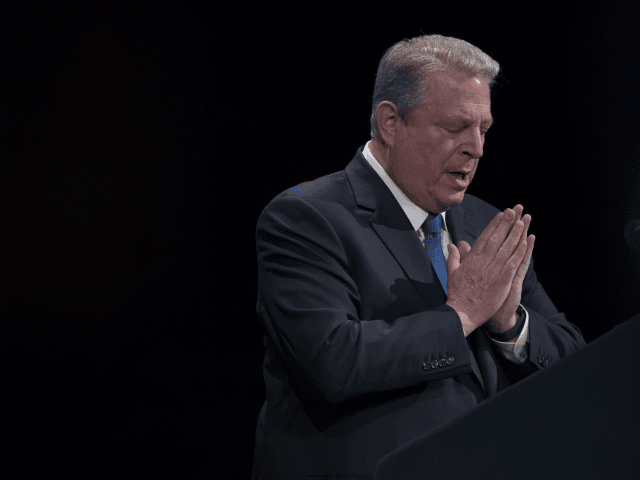 “In particular, his papal encyclical, Laudato si’, marked a crucial step for the Catholic church in leading the world to commit to addressing the climate crisis ahead of the Paris Agreement,” Gore said. “In these and many other ways, the Pope has been at the forefront in leading the world toward constructive climate action. Virtually all of my Catholic colleagues and friends are thrilled to the marrow of their bones that he is providing this kind of spiritual leadership. As am I,” he added. The pope’s vocal opposition to manmade climate change is not only crucial for Catholics, Gore said, but serves as an example for other spiritual leaders. “The Pope is a model for leaders of other faith traditions to communicate the dangers posed by the climate crisis and our duty as stewards of God’s creation to solve it,” he said. As he often does, Mr. Gore confused air pollution with CO2-induced climate change in his interview, and then went on to tie the two to race issues. What this has to do with climate change is anybody’s guess, since carbon dioxide is non-toxic and is unrelated to asthma. Gore’s 2007 documentary film, “An Inconvenient Truth,” was given an Oscar and showered in Hollywood accolades, though it also received its share of criticism. The former vice president followed up with a 2017 sequel titled “An Inconvenient Sequel: Truth to Power” that did not fare so well, even in Hollywood circles where climate change is the cause du jour. “The documentary follow-up proves to be less about global warming than propping up a hero awkwardly desperate to captivate audiences again like he did eleven years ago,” wrote Nick Allen on RogerEbert.com. “It’s like the Zoolander 2 of global warming documentaries,” he said. Despite resistance, Mr. Gore seems shows no signs of flagging in his crusade against manmade global warming. “I have been fortunate to be able to pour every ounce of energy I have into efforts to contribute to the solution to his crisis,” he told Vatican News.